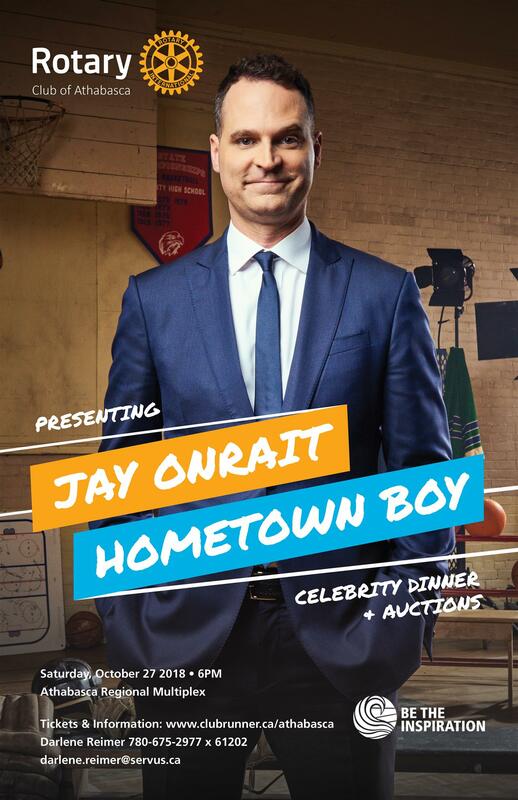 We had a fantastic presentation by Jay Onrait. The auctions were incredibly successful. Thanks to all sponsors & supporters! You’re invited! 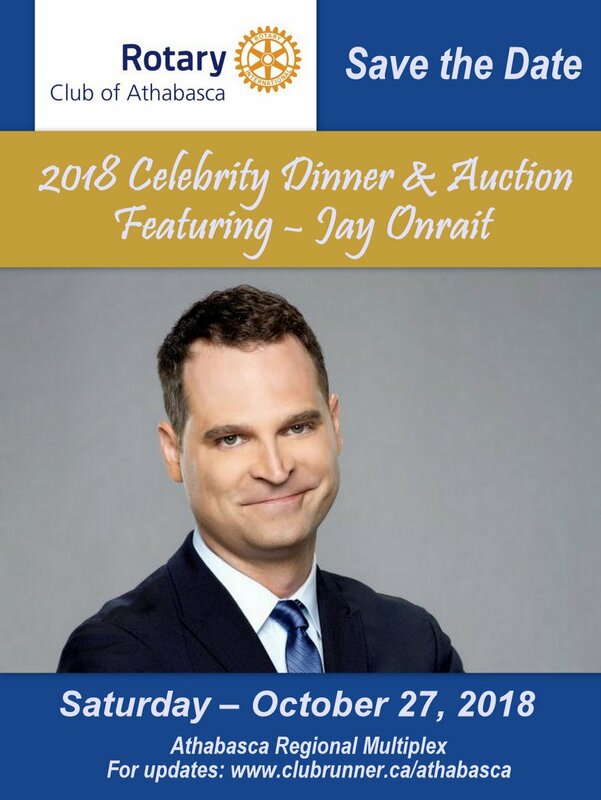 The Rotary Club of Athabasca and Rotary Athabasca Youth Development Association are pleased to host Jay Onrait, Athabasca home town boy, as our guest speaker for the Celebrity Dinner & Auctions on October 27, 2018. This is a major fundraiser and all net proceeds will be for the fitness centre in the new Athabasca Regional Pool facility. Youth Exchange student Julia Cygan is adding to her many Canadian experiences before returning home to Poland early July 2018. She is seen here with her Rotary counselor, Howard Peterson enjoying a ride in his classic car. 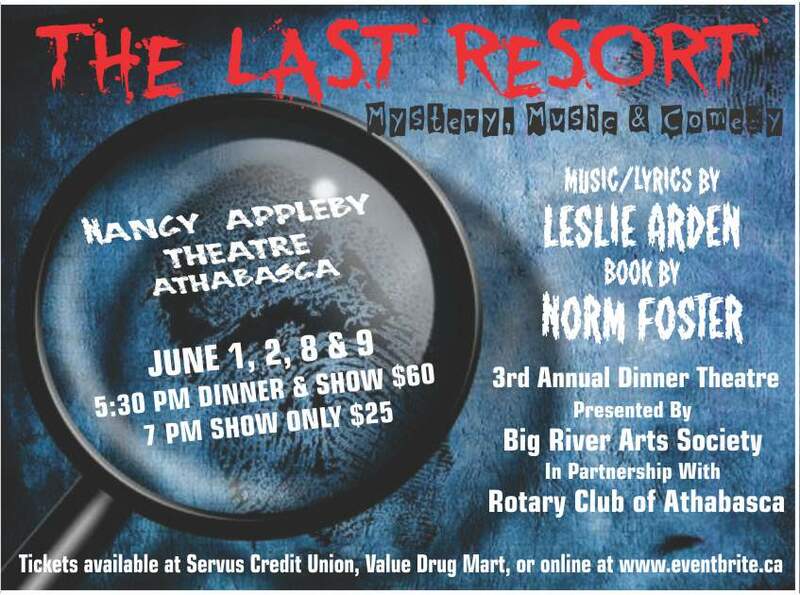 Another successful partnership between Big River Arts Society and Athabasca Rotary! 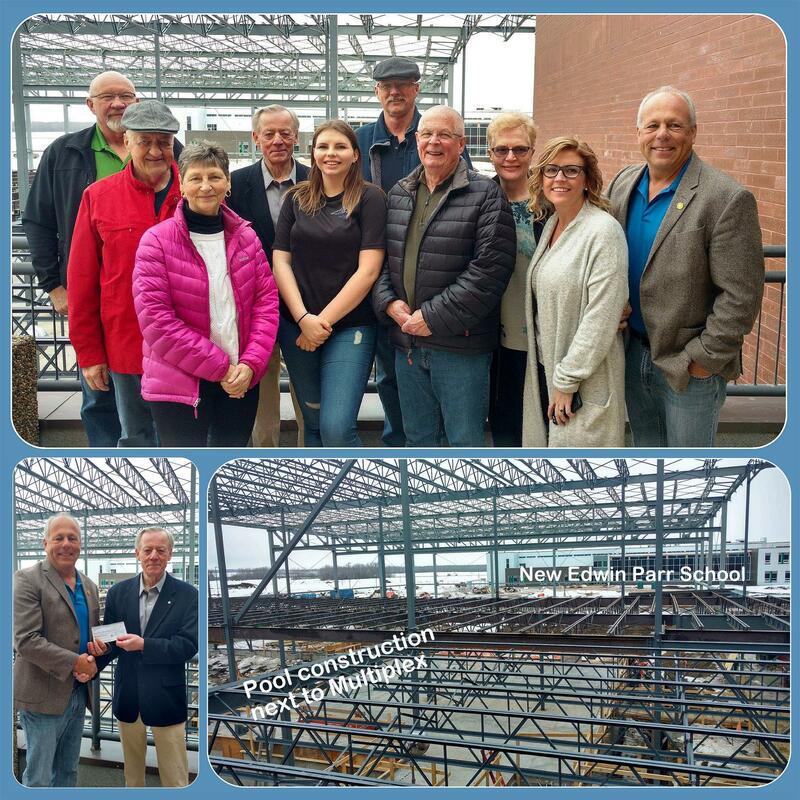 On March 16, 2018, at the kick-off of the fundraising campaign for the new Athabasca Regional Pool & Fitness Centre, our Rotary Club of Athabasca 2017-18 President John Ollerenshaw presented a $50,000 cheque to pool committee chair and Rotarian Rob Balay. Great start to our Club's $250,000 commitment for this fantastic project! 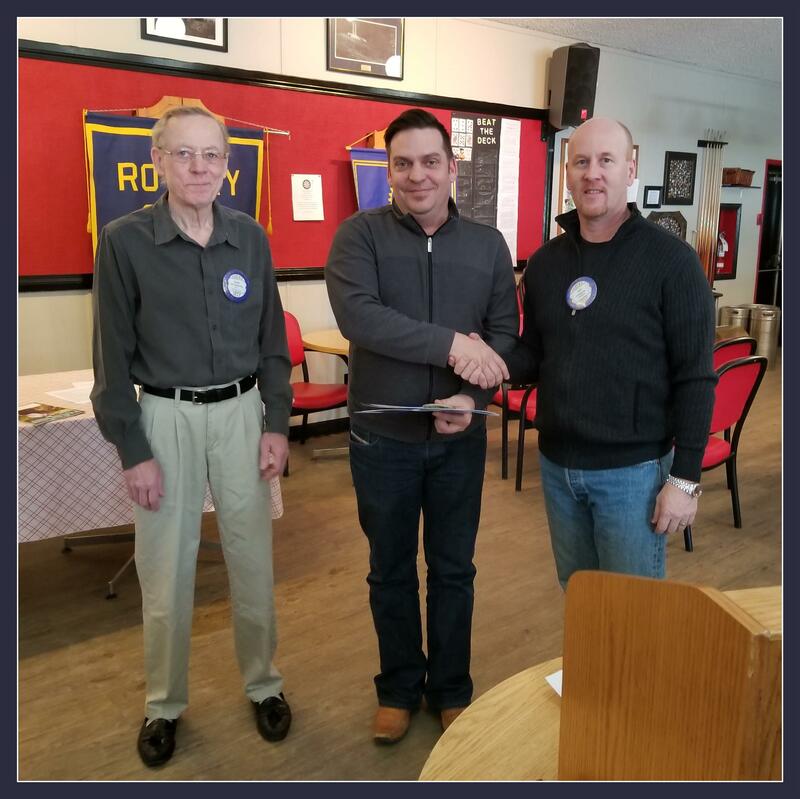 On February 21, 2018, the Rotary Club of Athabasca welcomed Aaron Durant as a new member. 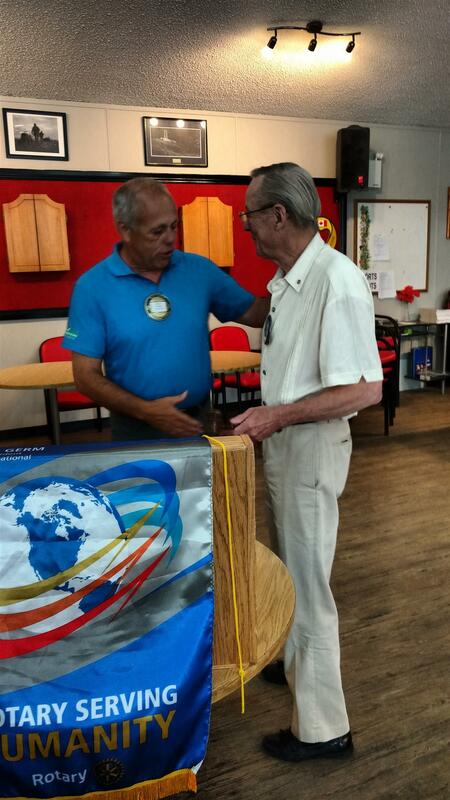 President John Ollerenshaw (left) and sponsor Jeff Johnson (right) congratulate Aaron. 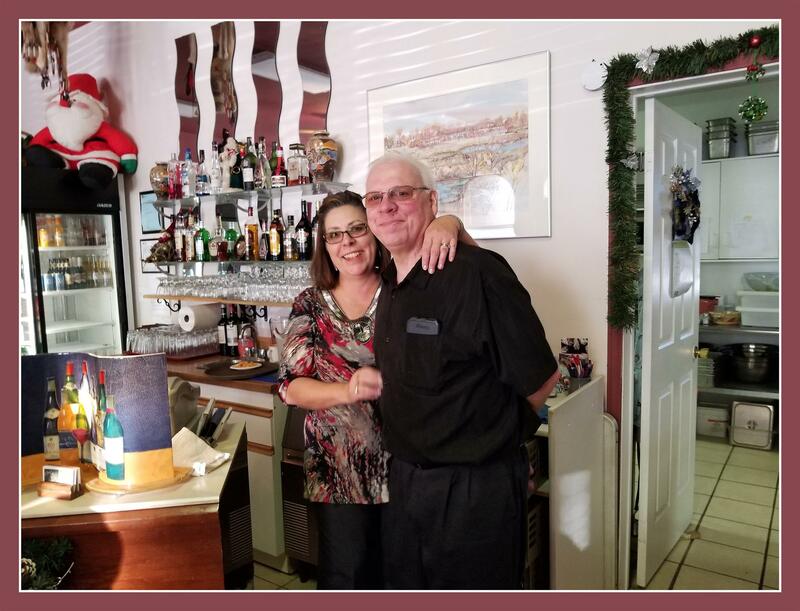 Thank you to Rotarian Al Zahar and Gerri Zahar from Elsa's Catering for going above and beyond, as always! On October 19, 2017, Athabasca celebrated local businesses in a grand way. 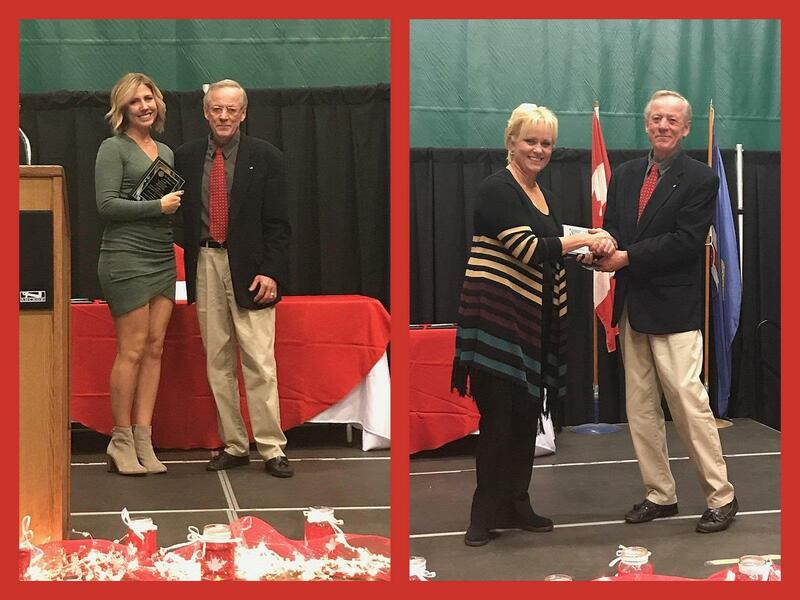 On behalf of our Rotary Club, John Ollerenshaw had the pleasure of presenting the Rotary Business Integrity award to Michelle Bishop of Elle's Closet Boutique & Beauty Ltd. Michelle also won the Young Entrepreneur of the Year award. Further on behalf of our Club, John presented the Employer of Youth award to Athabasca A&W (accepted by Laurie Bonell). 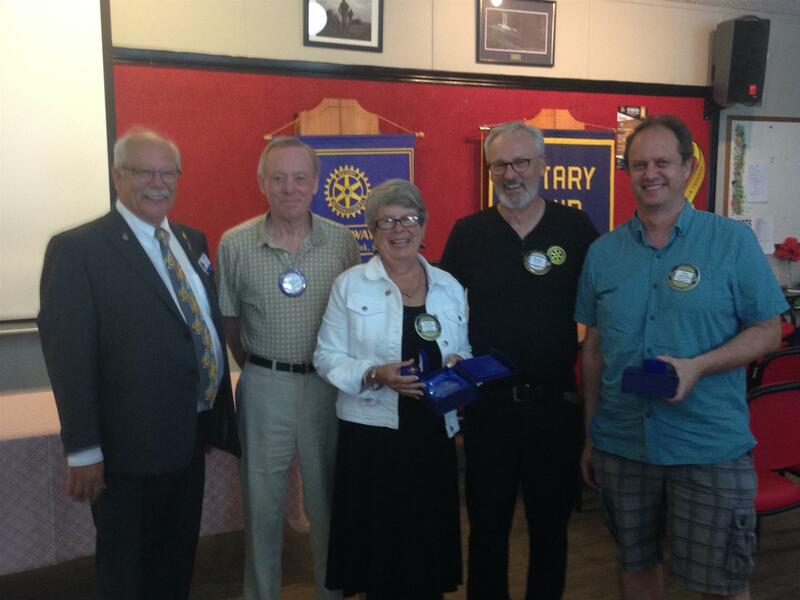 Kudos to Rotarian Darlene Topolinski Reimer who won Manager of the Year award, and Rotarian Leonard LeSage owner of Canadian Tire in Athabasca, winner of the Community Spirit award. 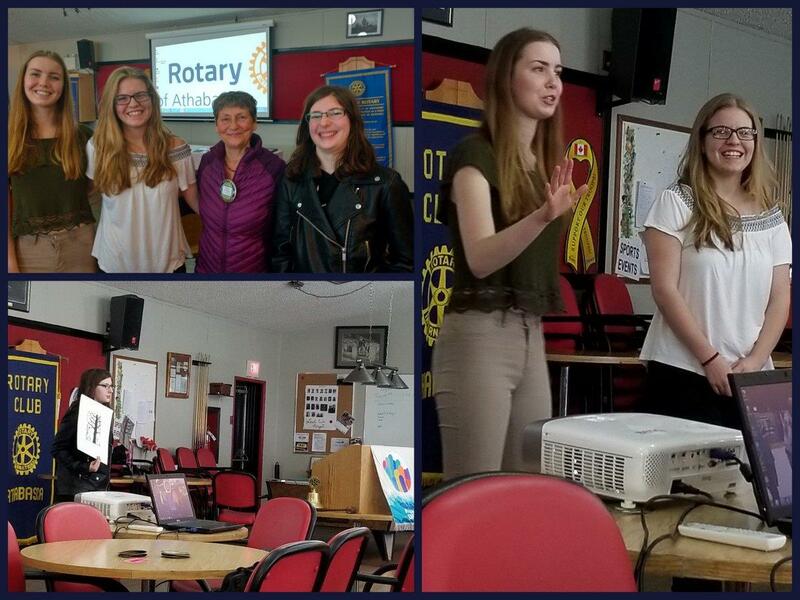 This summer, our Rotary Club sponsored three students to attend summer arts programs at Red Deer College. Katelynn Williams attended Summerscapes: The Visual Arts Workshop for Teens in August. Erica Bown and Sarah Overacker attended Artstrek: A Summer Theatre School for Teens in July. All said their camp experiences were life changing…in a good way! 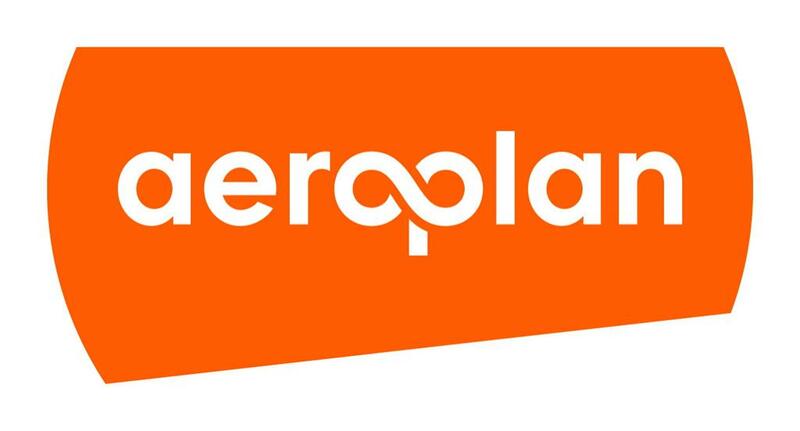 Do you have any Aeroplan miles that you are not planning to use? Instead, please put them to use by transferring the miles to our Aeroplan Beyond Miles Account for Rotary Athabasca Youth Development Association. Transferred miles will be pooled and auctioned. All proceeds will be used for Athabasca area community and youth development projects. Transfers of 1,000 miles or more can be made by anybody, anytime, so we appeal to Rotarians, family, friends and community members to help by donating extra miles. Go to http://beyondmiles.aeroplan.com/eng/partners/69 or click on the Aeroplan logo, and then Donate Now . For further information, please contact Mavis Jacobs at mavisj@telus.net or 780-675-7118. A group from the EPC Interact Club was given a tour of the neo-natal intensive care unit at Misericordia Hospital on March 3, 2017. Interact members raised $1000 for the new unit and this was a chance for them to see where the money would be used. The money was raised by a wake-a-thon Interact held, sponsored in part by the Rotary Club of Athabasca. The new NICU at Misericordia Hospital is now the most up-to-date unit of its kind in Edmonton. Serving an area from Red Dear north, parents and siblings are able to stay together in the hospital while premature babies receive state-of-the-art care. In photograph, from left to right: Kadin Pochynok, Emma Jensen, Bryanna Head, RN Rhea Shank, Jacob Kociuba, RN Robyn Halbert, Sydney Mansell and Rehma Kahn. The Rotary Club of Athabasca reaffirmed their support for the proposed new pool and fitness centre to be integrated with the existing Athabasca Regional Multiplex. 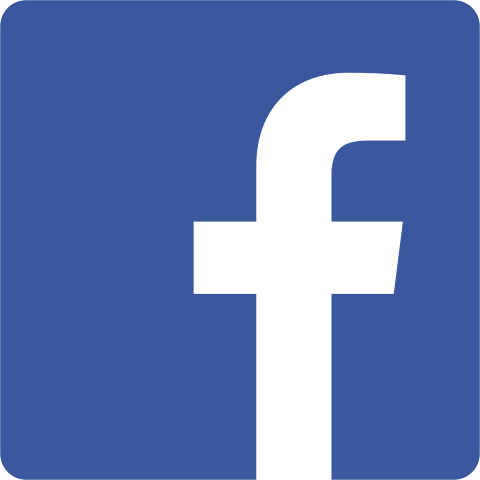 "We are very excited about becoming a partner in this integrated development and seeing this project move forward,” Rotary Club of Athabasca President Brian Bittorf said. Rotarians are hopeful that their demonstration of support for the integrated project will encourage other community organizations and individuals to do the same. At their March 16, 2016 meeting, the Rotary Club of Athabasca pledged a total of $250,000 over the next five years to support aspects of the project not funded through other means. 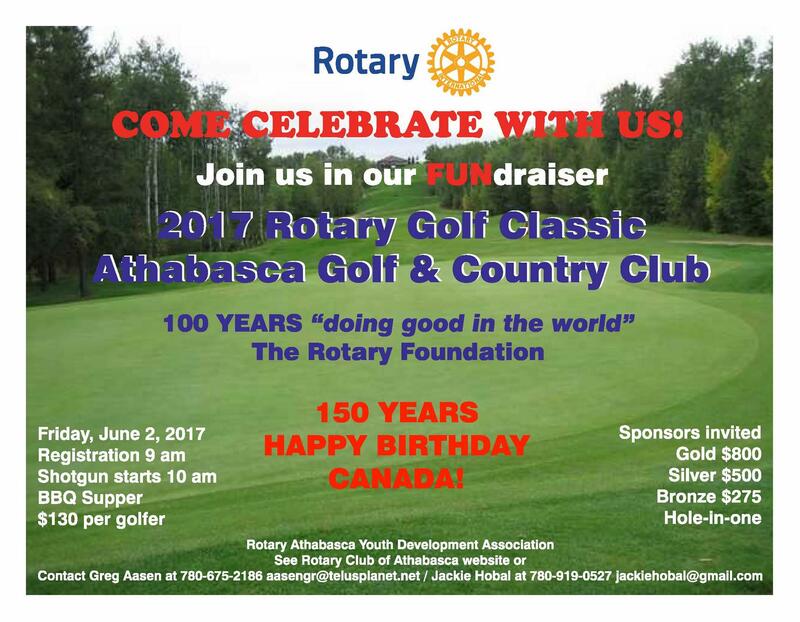 The Rotary Club of Athabasca was a strong supporter of the development of the Athabasca Regional Multiplex, contributing $500,000 towards the cost of its construction. 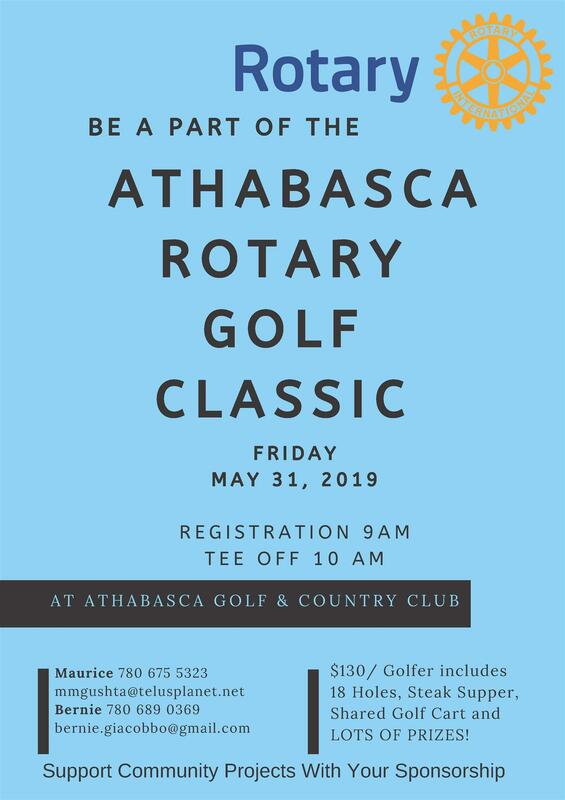 Examples of other community projects undertaken by the Rotary Club of Athabasca include the Rotary Way Trail, Riverfront Fitness Equipment, Rotary Spray Park, Pirate’s Point View deck and the Rotary Riverfront Clock. Canadian actor, singer/songwriter Tom Jackson will be featured at the Rotary Celebrity Dinner on April 22, 2016. Proceeds from this initiative will be directed to Rotary community projects. 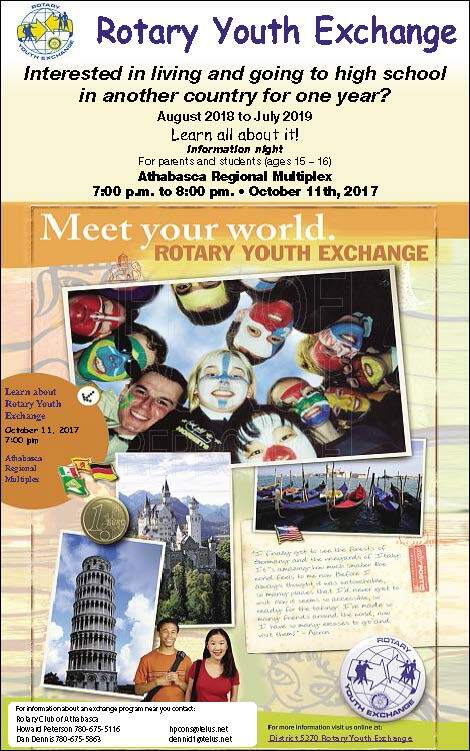 The Rotary Club of Athabasca is part of Rotary International, a worldwide network of more than 34,000 clubs made up of individuals who channel their passions into social causes that change lives and improve communities.